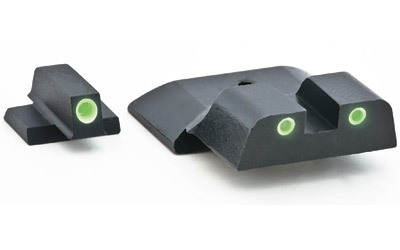 AmeriGlo brings a clear advantage to your shooting experience on and off the range.The original standard in self luminous night sights the Classic 3dot design is the most popular among personal defense military and law enforcement. It is machined of steel and utilizes Swissmade tritium light sources.This model has green tritium with white outline and a black frame. It is compatible with SW MP excluding Shield CORE and .22 cal models.